Buy a signed book here! All books are signed by Karl Newson. Please include a dedication note, if required. Choose a book from the drop down menu, then click the Buy Now button to pay for your purchase. Thank you! Choose from 6 different penguin greeting card designs! Choose 1 for £1.50 or 3 for £4. Each card is hand printed by Karl Newson. Due to the printing technique each individual card will differ in look, with some being a harder print than others, as is exampled in the images shown here. 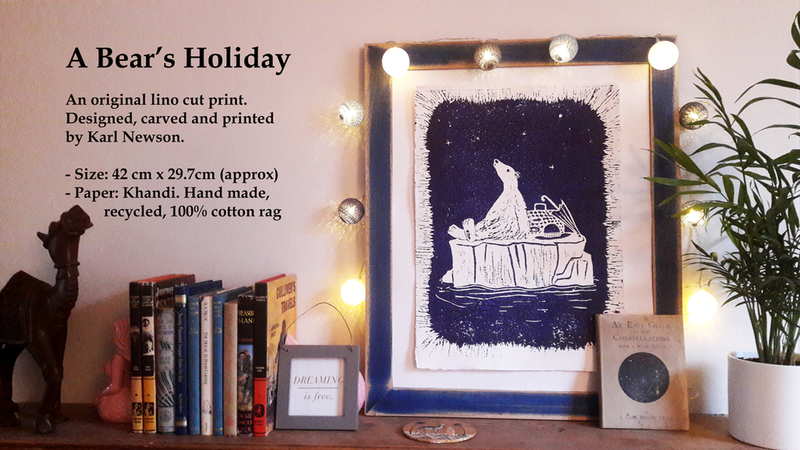 A Bear’s Holiday is a lino cut print, designed, carved and hand-printed by Karl Newson. Each print is original, in that the paint sets in different ways, allowing subtle differences in the look of the piece.